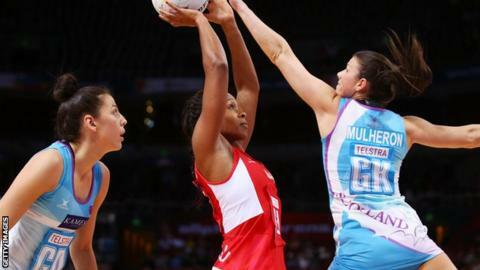 England secured a comfortable 60-19 win over Scotland on the opening day of the Netball World Cup in Sydney, Australia. The Roses led throughout after turning over the Thistles' first centre pass, and found themselves 16 points ahead at half-time. Despite a spirited third quarter by Scotland, who are ranked 11th, they were blown away by the world's number three side in the last 15 minutes. Earlier on Friday, Wales beat Fiji 59-52 in their Pool D opener. England Netball confirmed after their Pool B game that coach Tracey Neville's father, Neville Neville, had died in hospital after being taken ill in Sydney. An emotional Tracey led her side out on court and will stay with the team for the remainder of the competition. Local media reported her brothers, former Manchester United and England footballers Gary and Phil, were in the crowd to watch the win. Neville utilised all 12 members of her squad, with one eye on Saturday's game with Jamaica, which is likely to be their most difficult challenge in the group stage. As world number one, current holders, and 10-time winners, Australia are favourites to retain the crown on home soil. They got their defence off to a solid start with a 73-32 victory over 10th seed Trinidad and Tobago in Pool A. And the Diamonds were greeted by a VIP before the game; Australia Prime Minister Tony Abbott popped into their dressing room and tweeted the players a good luck message. Elsewhere, four-time champions and losing finalists in 2011 New Zealand started strongly with a 73-28 win over Barbados. The official opening ceremony of the tournament took place between the two games, held at the 18,200-capacity Allphones Arena, where all 16 nations were paraded. Jamaica finished day one as the top-scoring nation after their 90-44 victory over Samoa. It means the Sunshine Girls top Pool B going into their game with England - a rematch of the Commonwealth Games bronze medal contest, in which Jamaica came out on top. The prize for top individual scorer on the opening day went to Peace Proscovia, who notched 56 goals in Uganda's impressive 74-38 win over Zambia in Pool D.
It was a much tighter affair in Pool C, as Singapore beat Sri Lanka 56-43 while Malawi overcame South Africa 58-51.